The Dance of Marriage – Keeping in Step Through the Last Song is the title of Paul’s new book released on June 1, 2017. You can now order the book in either paperback or e-book at Amazon… or at Barnes & Noble. Listen to the Podcast about The Dance–The Story Behind the Story. The Dance of Marriage emerges from three decades of working with over 400 couples planning weddings that reflect commitments to building strong marriages. The result is a fresh, moving look at how the ordinary stories of married life add up to one extraordinary narrative of love. Charlie and Anna discover that every relationship has a beginning, every couple faces a crisis, and every marriage needs a miracle. Their twenty-first- century marriage story draws insights from a first-century wedding celebration in Cana of Galilee found in the Gospel of John where Jesus is invited to a marriage; in the midst of the celebration there is crisis; poignant advice leads to timeless wisdom; and the miracle of water becoming wine becomes an image of powerful transformation in relationships today. Along the way, readers become aware of the power of beginnings, the joy of celebration, the reality of crucible, the importance of counsel, the hope of miracle and the blessing of benediction in married life. 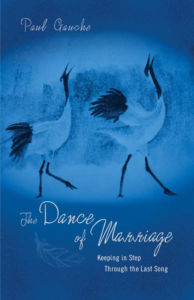 The Dance of Marriage then explores how introductions lead to deeper trust, commitment and engagement; how invitation gives way to ceremony which leads to marriage and the necessity of keeping promises; and how, in the midst of crisis, good advice leads to gratitude and hope. All of this moves into the extraordinary dance of love, joy, heartbreak, loss and redemption, ultimately revealing the high cost of love. Charlie and Anna consider the essential difference between a wedding and a marriage and why that matters. They meet crises with the wisdom of centuries-old advice and witness again the miracle of water becoming wine; the ordinary becoming extraordinary. As Charlie and Anna drink first from a glass of water and then from a glass of wine they attempt to describe what they taste and readers discover how their responses foreshadow the events of their married life together and come to know more fully and profoundly the dance of marriage.